Trik is presenting the outstanding driving characteristics and perfect weight distribution of the new Porsche Boxster and Cayman models using a high-quality mailing booster. 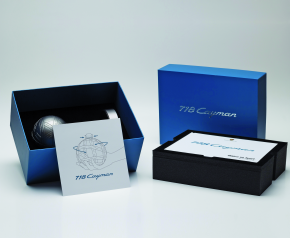 The special design that was realised in cooperation with Chromedia Dialogmarketing GmbH comprises of a ball 10 cm in diameter on a base with a model car on top. The highlight: Due to magnets inside, the car always heads towards the “North Pole”. However, the ball is turned and twisted, the varnished model car that is designed true to detail in the scale 1:100, stoically retains its position. The mechanism that holds the car on the ball was especially designed for this gimmick, the haptic illustration of the balancing act impressively symbolises the perfect weight distribution of the new Porsche models on the road. Furthermore, the ball is similar to a globe and thus stands for the worldwide distribution of the famous brand. Many good reasons for a distinction at the Promotional Gift Award 2017 in the category Custom-made Designs.